The Med is awash with incredible beach destinations – how to narrow it down? 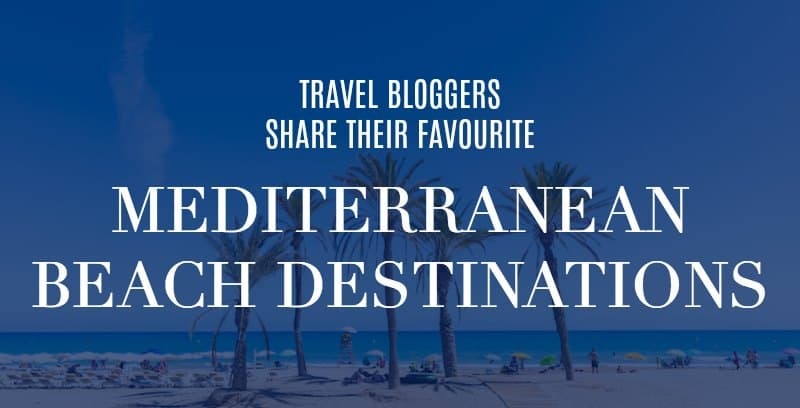 Easy – ask a group of travel bloggers to pick their best vacation spots in the Mediterranean area. I love the variety of responses I got to this question; it runs the full gamut from buzzing beach city to tiny uninhabited island. There are even a few places I’ve never heard of (which I love, because I spent a lot of time on Google Maps). There’s something on this list for everyone. But first, I’m going to share my own top 3 beach destinations that I know I’ll return to time and time again for a relaxing trip in the sun. So far, The Mediterranean Traveller‘s favourite beach destination is the Greek island of Naxos. I really think it takes some beating. Not only does it have some of the most deliciously sandy beaches in the Greek islands, but it’s one of my favourite islands for a chilled-out and authentic atmosphere. The main town – called Chora – has a small centre of whitewashed buildings, a crumbling Venetian castle, and bizarre ancient doorway which is the symbol of the island. Naxian food is fantastic, don’t forget to check out the assortment of local cheeses. But the best thing is that you can stay right next to the town beach and still be within walking distance of everything. But the star attractions are the long white sandy beaches of Prokopios, Agia Anna and Plaka. 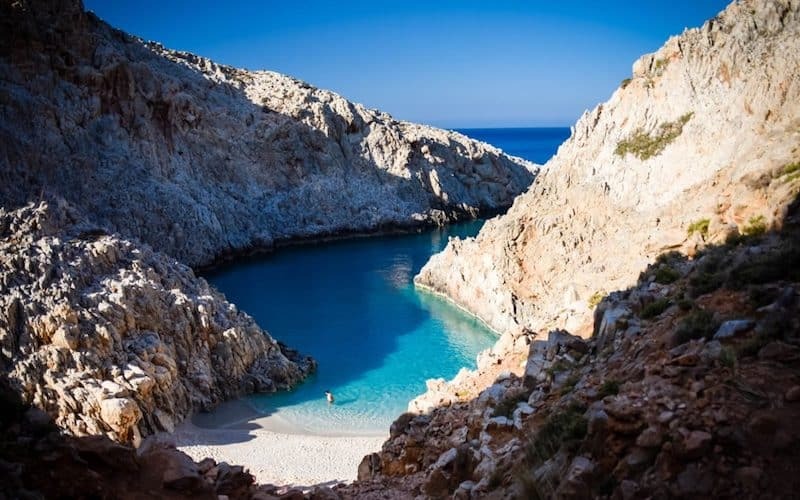 These beaches are all easily accessible from the Chora, which leaves the rest of the island’s beaches free for windsurfers and solitude-seekers. But not far behind is the Greek island of Corfu. And in particular, the resort of Paleokastritsa. I think it’s one of the most beautiful destinations in the Mediterranean full stop. Corfu is so green and lush, and this north west part of the island boasts dramatic coastal scenery. It’s the Med’s answer to Maya Bay. Ok so the beaches aren’t sandy, but there are lots of little coves and grottos just perfect for swimming. And if you do want sandy beaches there are several a short drive away (Corfu has a ridiculous number of gorgeous beaches, and all very varied). Add in a selection of laid-back tavernas and incredible sunsets, and you have a perfect Mediterranean beach holiday. I reckon it’s one of the top small beach resorts in the Med if you’re looking for an easy and beautiful package holiday, although there’s plenty of independent accommodation available too. Ok, so here’s something a little different for you. Tunisia is finally back on the tourist radar, after a couple of years in the doldrums. 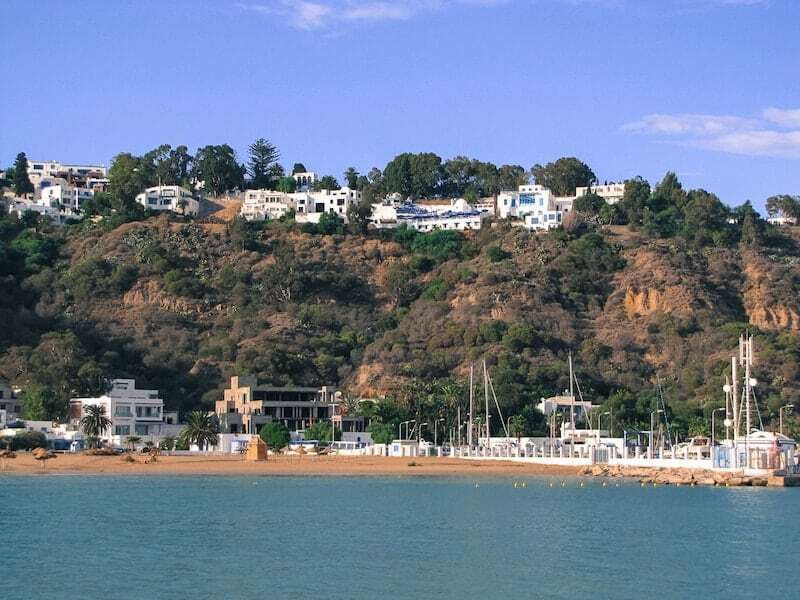 For a quirky and off the beaten track beach destination, look no further than Sidi Bou Said. This beautiful little clifftop town is one of Tunisia’s tourist jewels. It’s only a short distance from the capital Tunis, and you can reach it easily on the train. Perfect for a long weekend. The village itself, a former artist’s haunt and bohemian enclave, is painted blue and white and graced with ornate metalwork, intriguing secret courtyards, historic cafes, fragrant flowers and photogenic wooden doors. It’s surely one of the prettiest villages in the Mediterranean. You can enjoy your breakfast with an incredible view over the Bay of Tunis, then nip down to the beach for a swim. If you’d rather stay right on the beach then you can stay at nearby resort La Marsa, but little Sidi Bou Said has all of the charm. Get here quick before the Instagrammers do. Ok, so there you have my top 3 picks. But where do other travel bloggers go for a beach holiday? 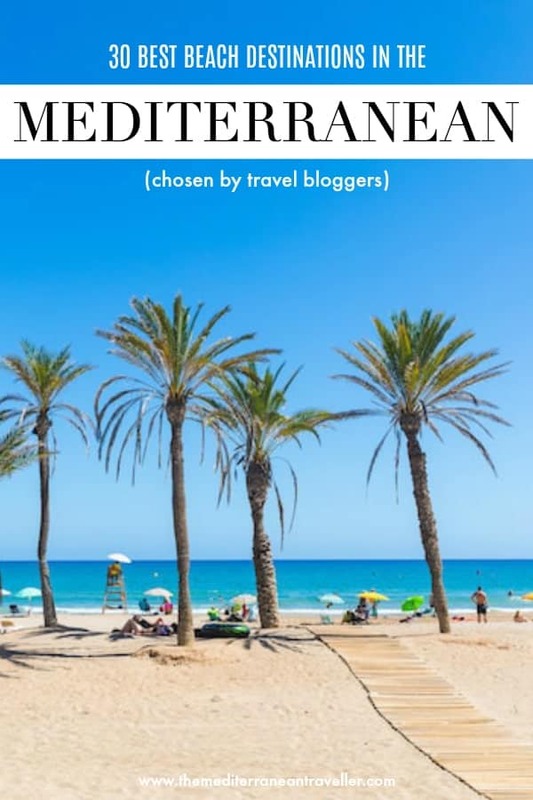 Let’s discover where they rate in the Mediterranean for a summer break . . . The South of France is known for its glamour, glitz and beautiful Mediterranean beaches which stretch all the way from the Italian border to the Spanish border. La-Grande-Motte, a beach town just 2 hours from the Spanish border and sitting on the city of Montpellier, upholds France’s glitzy reputation with a wide range of stunning sandy beaches. La-Grande-Motte provides a 7km long stretch of stunning beaches filled with fine sand, clear sea, small dunes, and pop-up paillotes. 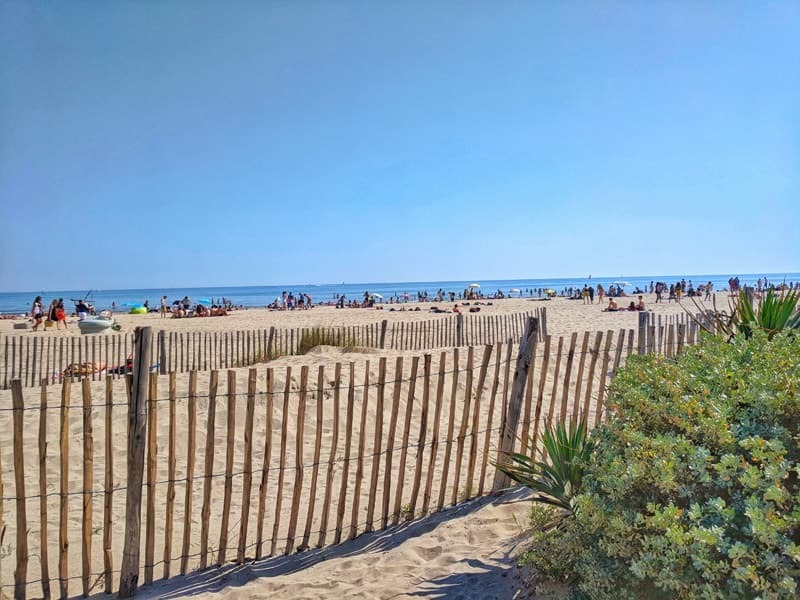 A paillotes, if you’re unfamiliar with the term is a pop-up bar/restaurant, around just for the summer season, and they’re numerous within La-Grande-Motte. The majority of pailottes are based around the Grand-Travers beach. They offer a wide range of cold beverages, gourmet food and an incredible atmosphere. Well, they turn into beachfront discotheques. But the paillotes aren’t the only reason to visit La-Grande-Motte. The sea at La-Grande-Motte is perfect for swimming, watersports and family fun. The blue flag (Le Pavillon Bleu – the symbol of exemplary environmental quality) beach has progressively shallow to deep waters and a small incline from the water. One thing that makes this beach stretch unique is the people. La-Grande-Motte is a touristy town, however many of the tourists still come from within France. That means many of the beaches still have an awesome French Vibe. You may even witness the beachfront dancing that we did. It started with a man, a speaker and some romantic music then after just minutes couples started to dance together – it’s such a beautiful and unique sight to witness. When I think of beautiful Mediterranean beaches, I think about Alexandria. Located on the coast of Egypt, this city is also a port. It is a popular getaway for most of the people who live in the Egyptian cities and that was why we decided to head to Alexandria from Cairo by train. The moment you reach the city you realise that it’s very different from the capital city of Egypt. The cool sea breeze is such a big respite from the heat. Even though we arrived at night, the view of the coast was amazing. That being said, when we got up in the morning and saw the sea, the sand and the coast in broad daylight – it took our breath away! Alexandria has a number of beaches. Many of which are private beaches that are annexed by the large hotels on the main strip. That doesn’t mean that public beaches don’t exist. They do, you just have to pay for the beach chairs. Luckily the charges aren’t too high and if you don’t want to use a chair just carry a picnic blanket instead. 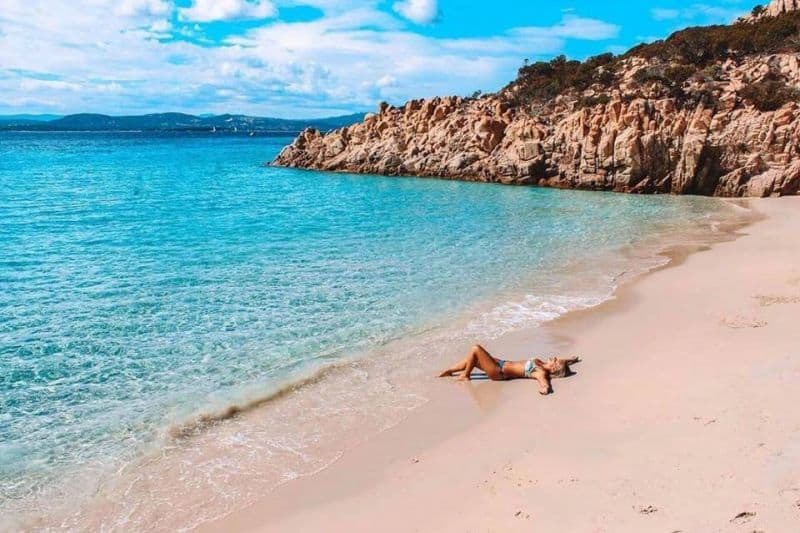 Costa Rei is one of the best beaches in Sardinia and, without a doubt, one of the best beach destinations in the Mediterranean. 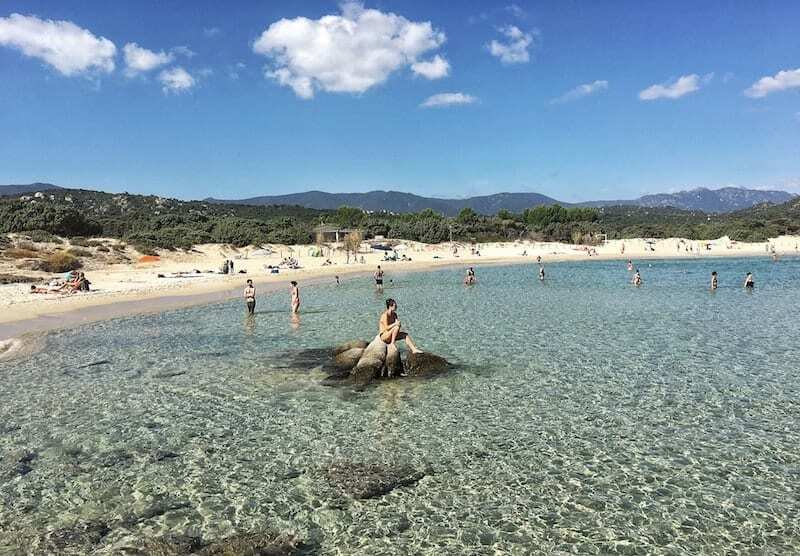 Located on the south east coast of the island, at about one hour drive from Cagliari (Sardinia’s main city), Costa Rei is a favorite of both locals and tourists thanks to its easily accessible beach, which is characterised by beautiful, fine golden sand and incredibly clear waters. There are several access point that make it easy to get to the beach even with strollers or wheelchairs; and various places to rent chairs and umbrellas and to organise boat trips to the nearby islands or along the gorgeous coast. The village itself is quiet and safe. There’s a handful of small shops, some good restaurants (head to Sa Cardiga e Su Pisci for the most mouthwatering dishes; Chaplin is right on the beach and more easy going and affordable, but equally good), a few all-inclusive resorts and various real estate agencies where to look for a good apartment. Nestled into a tiny corner of the already small island of Malta sits the fishing village of Marsaxlokk, known for its colourful wooden fishing boats, delicious seafood restaurants that line the waterfront, and fish market on Sundays. Any trip to Malta could be improved by a visit to Marsaxlokk – it’s easily one of the prettiest places on the island! Once you’ve had your fill of fish and are finished photographing the beautiful boats, head out of town on a 35-minute walk, complete with beautiful vistas over the Mediterranean Sea, to St. Peter’s Pool (if you want to avoid the walk, it’s also possible to negotiate for a taxi). Here, you’ll find a nature-made pool carved out of the Mediterranean Sea, perfect for diving, swimming, or sunbathing on the enormous boulders. 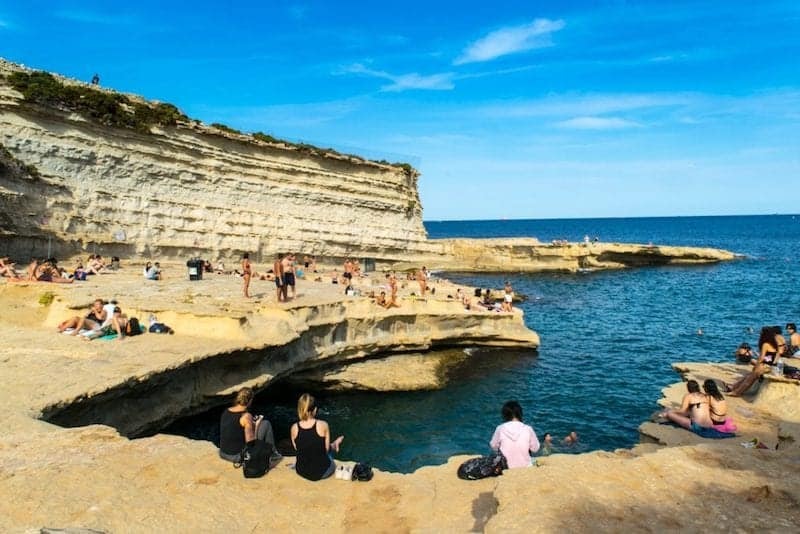 It’s not quite the same look as a traditional sand or pebble beach on the Med – but its unique look and amazing swimming opportunities make it a perfect beach getaway all the same. Lopud is a real hidden gem in Dalmatia. We spent 4 nights on the island during our kayaking course in Croatia. It very quickly became our favourite place in the country. Lopud is perfect for everyone who wants to relax and enjoy nature. The island is car-free, so everyone gets around by walking, cycling or driving a golf cart. There are a few restaurants in the main town, and you can also find two shops and a bakery. Sunj Beach is the most famous beach on the island. It is about a 20-minute walk from the main town, or you can take a taxi golf cart. This beach is sandy and very shallow, so it is very popular with families with small children. You can also rent kayaks, paddle boards or jet skis here. There is a cave along the coastline which you can only access from the water, so I suggest renting something so you can head out and explore. Cefalu is a charming medieval town about an hour from Palermo, the capital of Sicily. The town is sandwiched in between the mountains and the sea so it’s beautiful no matter which way you look. Think narrow cobble-stone streets and the obligatory seafront promenade for your evening walk. There are sun-drenched buildings almost to the edge of the beach. There’s also a massive Norman cathedral for those interested in Sicilian culture and history. It’s so picture perfect that you can see why Giuseppe Tornatore chose Cefalu as the setting for his movie Cinema Paradiso. 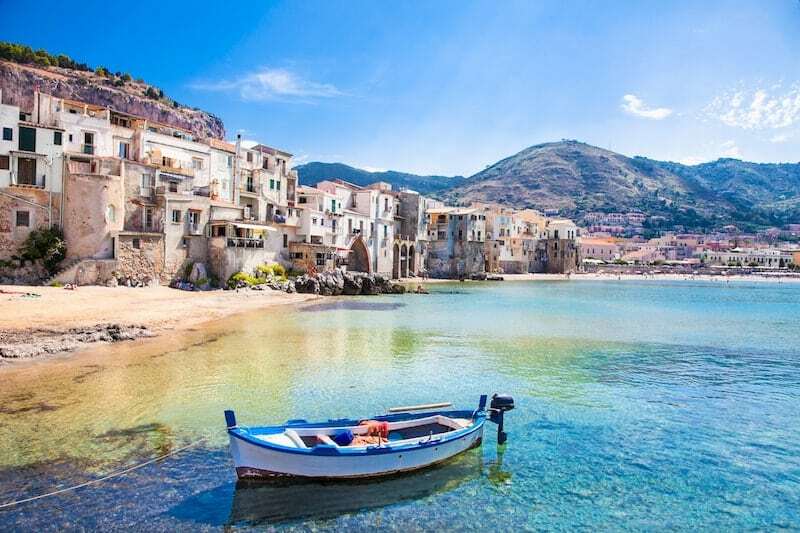 Attracting a mainly Italian crowd and the occasional foreign tourist, Cefalu doesn’t suffer from the over tourism that we encountered in other popular Sicilian beach towns. The sheltered sandy beach is perfect for children to play. You can relax at the beach knowing they won’t get into any trouble. Nearby there are pizzerias and gelaterias galore for when you feel peckish. As a working fishing village, the fish and seafood is superb. We had a perfect family beach vacation lazing in the sun, eating and drinking. Orebic is the largest town on the Peljesac Peninsula, located partway between Dubrovnik and Split. It may not be as well-known as other destinations, but it has some of the best beaches in Croatia. The town itself is sleepy and relaxed. The people are friendly and the pace is slow. There are plenty of accommodation options in town including AirBnB, luxury hotels and a number of campgrounds if you are traveling Europe by campervan. You may be tempted to explore the dozens of secret coves peppered along the peninsula. 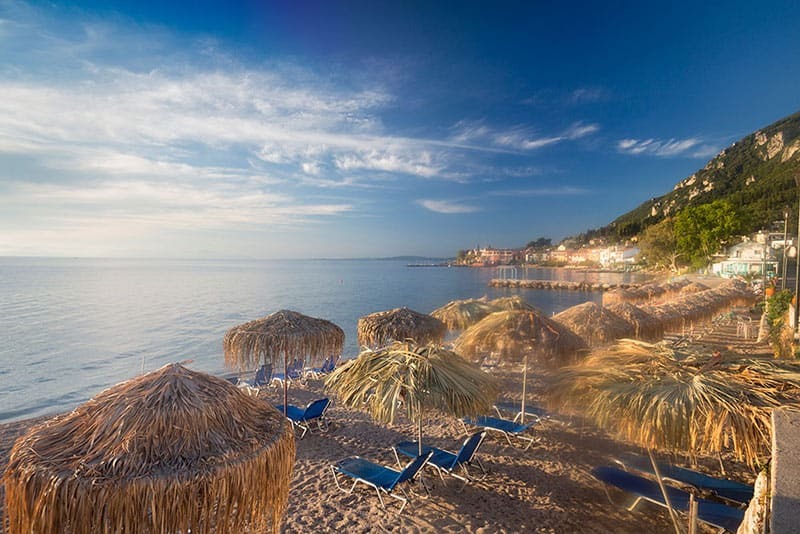 But first, make your way to the beach closest to town, Trstenica Beach. 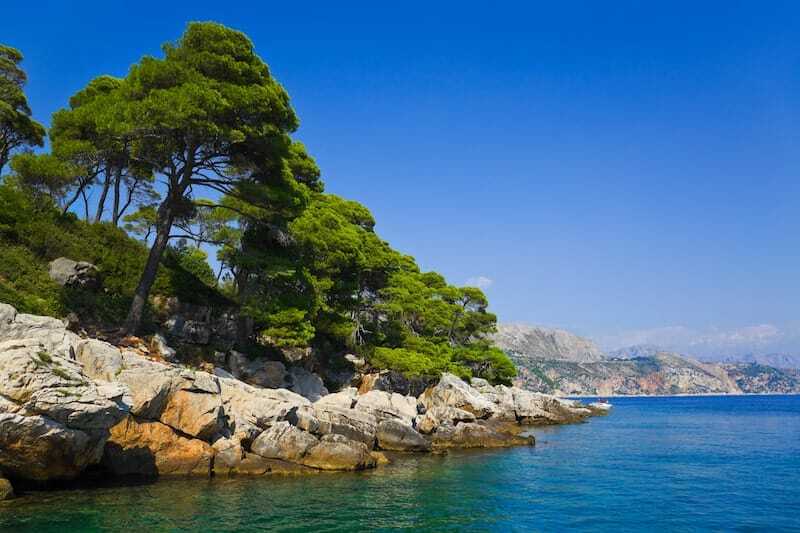 Lined with pine and olive trees, Trstenica Beach is a popular destination with families and couples alike. Cafes line the beach and equipment is available to hire. The beach is clean, the water warm and crystal clear. Once you tire of the beach, make your way to one of the world famous wineries nearby for a little wine tasting. Alternatively feast on the freshest of seafood at a restaurant in town. If you love the outdoors, grab a trail map and explore the surrounding hills. For something a little less strenuous, hop on the ferry to the medieval walled town of Korcula. Located just 2.5km across the bay, Korcula is one of the most popular island destinations in Croatia. Once you have explored the island, escape the crowds and head back to Orebic, a little piece of heaven. Located only a few kilometers away from the infamous excess of Ayia Napa, Protaras and Fig Tree Bay are the ideal quiet alternative to their more boisterous neighbour. A beach with Blue Flag status the stunning clear turquoise waters around Cape Greco are perfect for diving and snorkeling, some of the most popular in the entire region. Generally speaking, Protaras is generally a very family oriented area. Various hotels and apartments line the main streets along with your fair share of inevitable souvenir shops and places to stock up on your buckets and spades. A water park and mini golf course are close by and always a popular choice. If you have the stamina, the climb to the stone Church of St. Elias is rewarded with some of the most picture postcard views of the entire region stretching beyond Famagusta. Explore further and escape to the almost secret cove of Sirena Bay near Paralimni. Even though Protaras is positioned as the more laid back answer to Ayia Napa that does not mean it is lacking in good quality bars and nightlife. Just don’t expect non-stop club music and noisy reveling blaring out till 6am! Friendly, lively and so clean – that is how best I would sum up Protaras. And not forgetting some of the best calamari as well! Cavtat is a small town situated on Rat peninsula in Croatia, almost 20 km south of Dubrovnik. After visiting Dubrovnik and its beaches, overcrowded by tourists, this charming little town will surely offer you much more calm and a relaxed stay. This ancient city is not only attractive because of historical heritage but also due to its nature, Mediterranean vegetation, sand beaches, bays, and crystal clear unpolluted water. For those who are interested in active holidays, there are many sports possibilities, such as diving, sailing, fishing, jet-ski. Despite the petite size of the town, it has rich nightlife events, from music and theatre festivals to a carnival held in July. And there’s a wide range of accommodation, from luxury five-star hotels to more intimate family-run affairs. Culture vultures will be interested in the historic parts of the town, such as the Rector’s Palace and the memorial home of Vlaho Bukovac – a great painter from Cavtat. The home has been transformed into a gallery, displaying personal belonging and portraits of his family members. You also visit the beautiful Račić Family Mausoleum and the Church of St. Nicholas, which contains the work of several well-known painters. Thanks to various lovely restaurants, you can taste here the typical Mediterranean gastronomy, full of fresh local vegetables and abundant with different kind of fishes. With such dishes and local wines you can be sure that visiting Cavat will not definitely disappoint you. When you think of the best beach destinations in the Mediterranean, Collioure may not immediately spring to mind but it definitely ticks plenty of boxes. With its pretty orange-hued facades, it’s easy to see why the town was a favourite amongst painters like Matisse, Chagall and Picasso in the 20th Century.It’s a photographer’s (and artist’s) dream, and perfect for a short beach break. 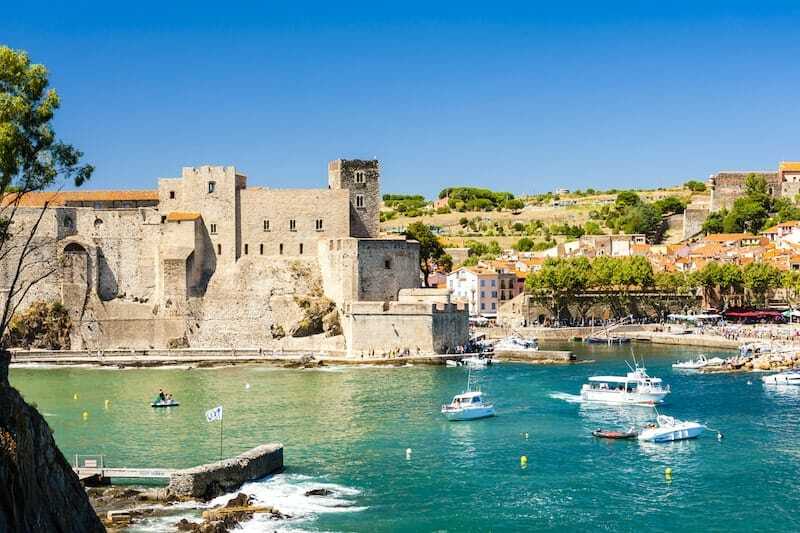 Situated in France, just 26 kilometres from the Spanish border, Collioure has a strong Catalan influence which is reflected in the cuisine, and you can enjoy some of the freshest and tastiest seafood at the many cafes and restaurants. Built beside a small bay, Collioure’s old town is a jumble of narrow cobblestone alleys lined with boutiques, souvenir shops and restaurants, and is overlooked by the 14th century Chateau Royale. Collioure’s main beach can be found in the curve of the bay and is a great spot for sunbathing and swimming.Because of its location around a calm bay, the sandy beach is popular with families and numerous water sports can be enjoyed by all ages. The beachside promenade is alive in summer time with outdoor diners and carousels. The hills surrounding Collioure and nearby Banyules sur Mer are home to some of the regions’s famous vineyards and there are lots of Caves (cellars) where you can taste the local drop. To really appreciate the town’s position nestled in the bay, jump aboard Le Petit Train for a 45-minute ride through Collioure and the surrounding vineyards. The English commentary (via the included headphones) is informative and offers a great insight into the Collioure of yesterday and today. Mykonos is one of my favourite islands in the Mediterranean. Yes, it’s touristy, but I love it because there is so much to see and do, and so many stunning beaches within a short distance from one another. 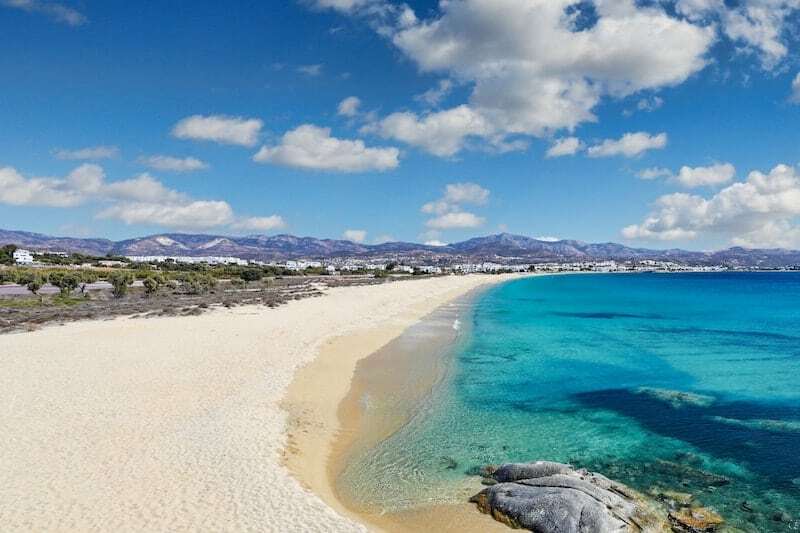 The main city on the island, Mykonos Town, is located on the west – most nice beaches in Mykonos are on the south coast, within a few kilometres from Mykonos Town, and there’s really a lot to choose from! Two of the most popular party beaches in Mykonos, Paradise and Super Paradise beach, are less than 10 km from the town – they’re ideal for those looking for beach parties, music and dance, as well as watersports. 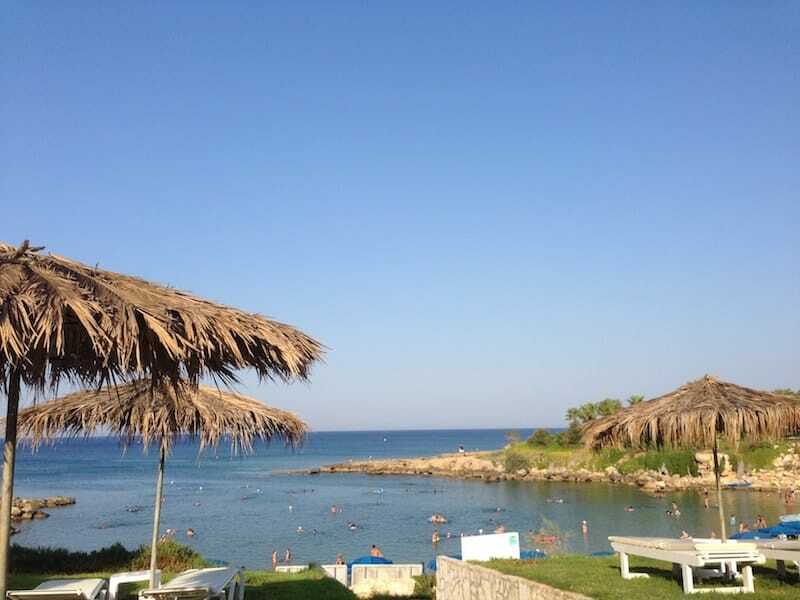 Another great beach is Ornos, a great family friendly beach just 3 km from Mykonos Town, well set up with sunloungers and umbrellas, ideal to just lie in the sun. However, my favourite beach near Mykonos Town is Elia Beach. 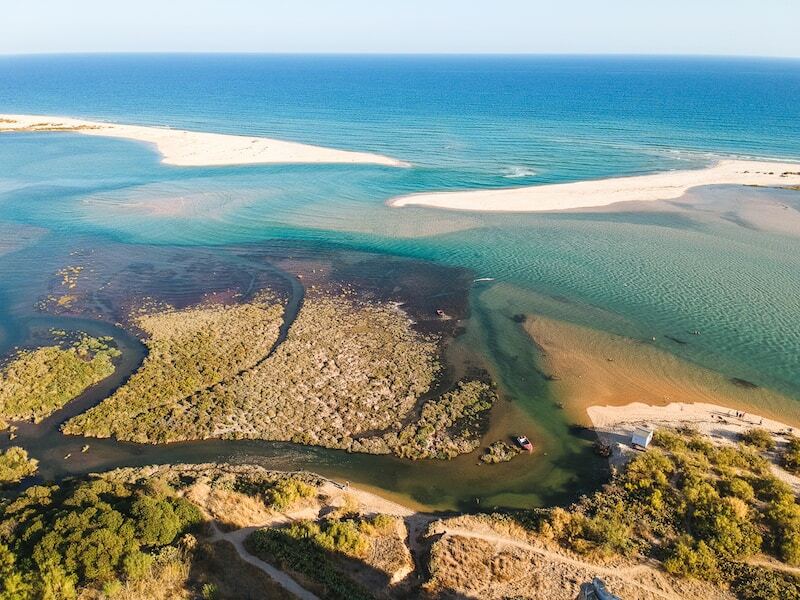 It’s a bit further from the town, about 10 km away, but it offers so much to see and do – from swimming to snorkelling, windsurfing and parasailing. There are also some secluded parts, and a nudist-friendly section! Cádiz can be found in the south of Spain, in the Andalusia region, just below Seville. It’s a coastal town built onto a sandbar peninsula, so if you like beaches you’ll like Cádiz! There are 83 of them in fact! Our favourite is the lively and popular golden sand Playa La Caleta which sits alongside the beachside promenade with alfresco terraces to take in the views over glasses of wine and fresh seafood based tapas. From this beach you can also walk out to see the Castle of San Sebastián. This is a military fortress from 1706 built on a small island about 1 kilometre off the coast of La Caleta beach as joined to the mainland by a stone levee, a novel way to extend an evening promenade stroll! The levee also helps to keep the swimming conditions at Playa la Caleta manageable for all ages and abilities. As well as incredible beaches Cádiz also boasts incredible architecture across thousands of years of history! Within it’s medieval old town warren of streets you can find the Roman Theatre ruins which are the second largest in the world and the site allows you to walk through the tunnel out into the seating area just as the patrons must’ve done over 2000 years ago! 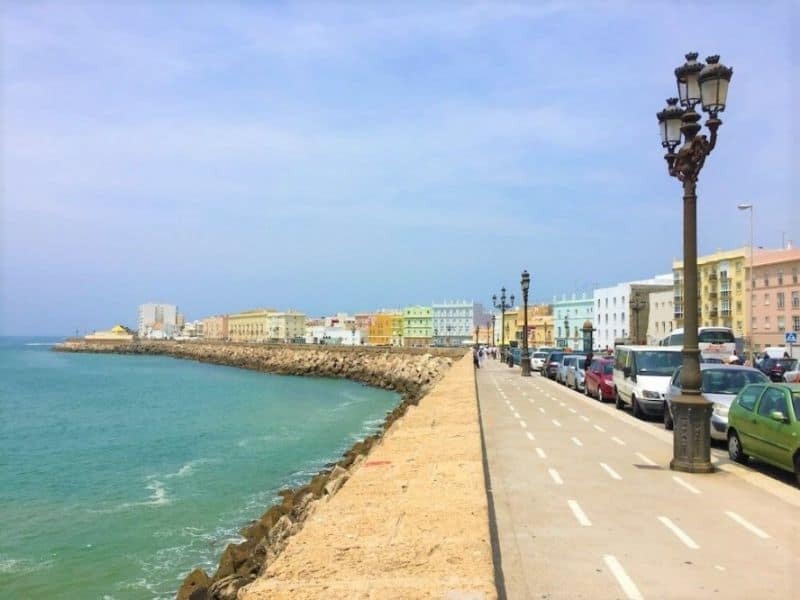 We visited during a 2 week trip to Spain and found the Pensione Las Cuatros Naciones to be a well-priced, clean and friendly family run place for centrally located accommodations to Cádiz old town and Playa la Caleta. Just an hour’s ride from the capital city of Tunis lies one of the most beautiful beaches in all of Tunisia. Sidi Ali El Mekki lies on the southern tip of Cap Farina. Navigate through the hills, and behind the cliffs hides the blue-green waters of the Mediterranean Sea. 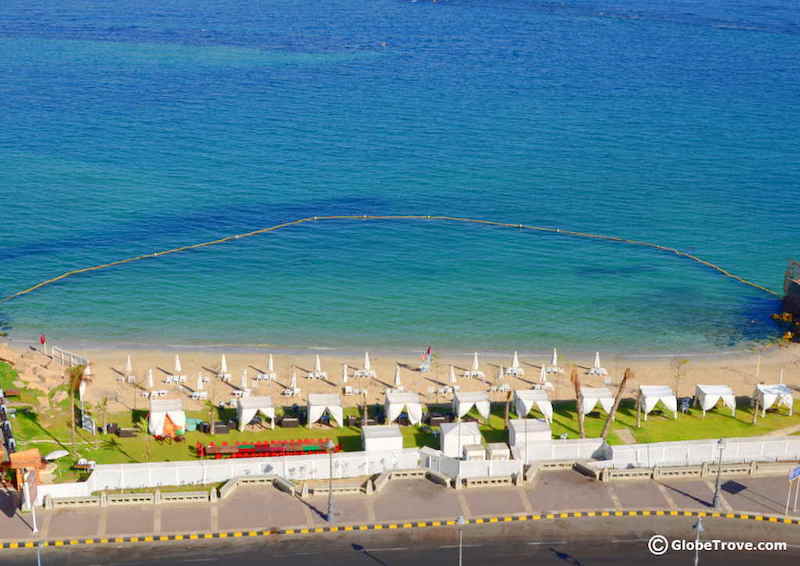 Sidi Ali El Mekki has some of the hottest temperatures in Tunisia, which mean beach season lasts well beyond summer! It’s easy to spend your entire day floating in the Mediterranean or maybe renting a boat to take you around the coast. Along the beach, you’ll find restaurants in modern huts, with cabanas lining the shore. Stop by Madera Restaurant, for just 20 Tunisian Dinars ($7 USD) you can relax all day in your own private cabana which includes a seafood lunch! It’s easy to see why this clean, calm beach is a favorite weekend getaway for Tunisians. The best part is tourists rarely travel to Sidi Ali El Mekki, which means you will rarely find the shores crowded with people. We discovered the town of Giardini Naxos rather by accident, but it couldn’t have worked out more perfectly! The lovely seaside town is located just a stone’s throw away from the famous Taormina, in the province of Messina. The noodle-shaped town stretches along the sea and thus offers a high number of beaches. 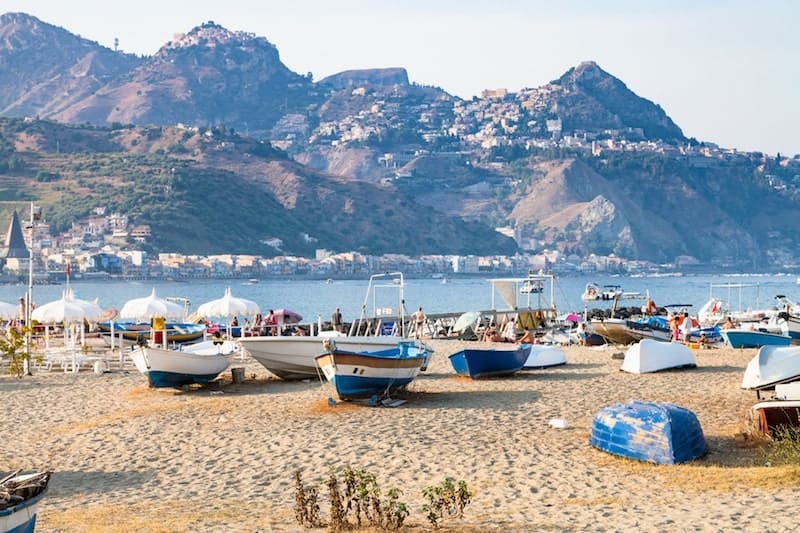 As how it’s typical in Sicily, most beaches are accessible via a beach bar. There’s absolutely no shortage of such bars and they are good too. Parasols and beach chairs are available for rent. Since we wanted to do just a quick soak, we were even allowed to use a pair of chairs for an hour for free. The beach is sandy, smooth, and with no rocks. Since you’re bathing in the Mediterranean, the water temperature is lukewarm. I’d call it cold, but don’t mind me, I’m too cold-sensitive and spoiled! Apart from walking along Giardini Naxos’ beaches, we enjoyed strolling on the main road passing by buildings built in the 50’s or perhaps 60’s with the characteristic pastel retro look. Many of them house hotels too. Iztuzu beach, near Dalyan, in the southwest of Turkey is commonly referred to as Turtle Beach. The reason is apparent: Iztuzu is one the principal nesting places in Turkey for the Caretta Caretta or Loggerhead turtle. These endangered and protected species lay their eggs on the beach between May and August, while the hatchlings make their way back to the sea somewhere between July and September. Not to worry, this only adds to the beauty of the area, since this is what kept this unique beach from becoming a property development area. 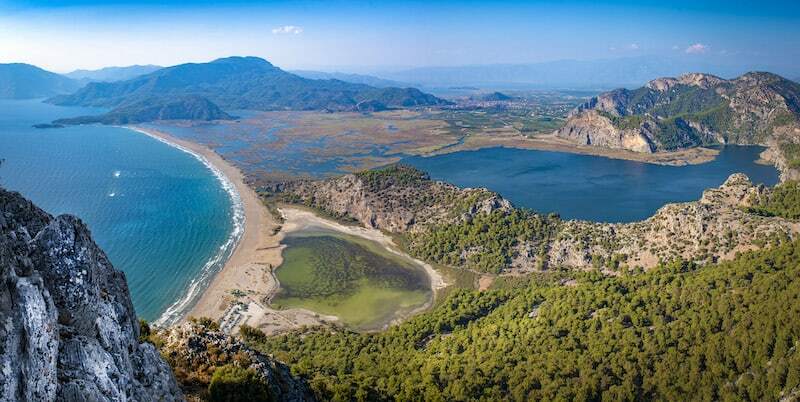 Sandy Iztuzu beach is situated at the end of the Dalyan river delta and is about 4km long. There are beach facilities such as restaurants, showers, and sun loungers on both far ends of the beach. The middle part has been kept untouched and is quiet, even during the height of summer. Swimming conditions are excellent at this blue flag beach and – during the season – lifeguards are present most of the time. You can easily access Iztuzu beach from nearby Dalyan, which is the perfect base if you want to spend more time in the area. One end of the beach, which also houses the turtle rehabilitation center, has a large parking area and is served by public transport. Alternatively, you can take a boat trip from Dalyan to the other end, which is our preferred method! Know that a public boat goes there, offering a pleasant and very budget-friendly boat ride. Situated between Milos and Kimolos, Polyaigos is the biggest uninhabited island in the Aegean Sea – a true hidden gem in the Cyclades. The name of the island translates as many goats, and these are the permanent residents who you will come to meet here. Surrounded by mesmerising crystal clear waters, Polyaigos is a heaven on earth. 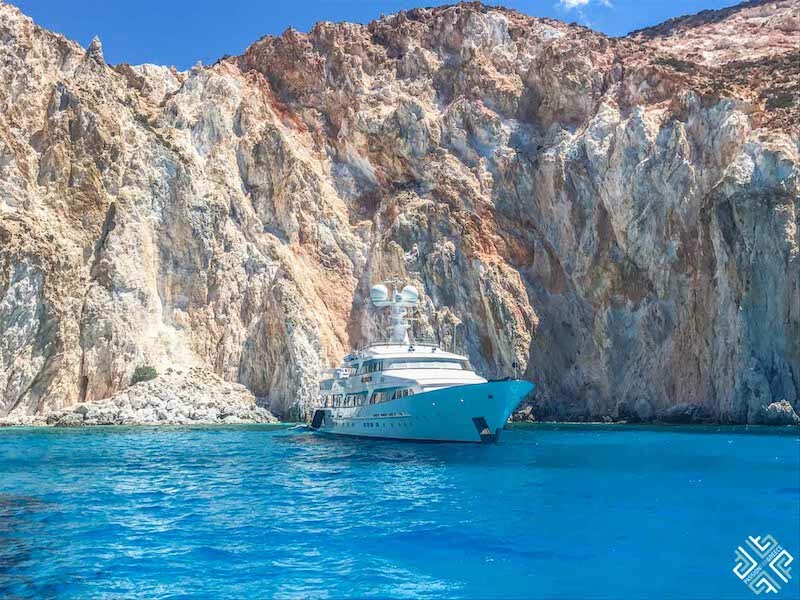 You can take a boat from Kimolos or Milos and spend the day swimming in the open sea. The refreshing blue waters will feel like something out of this world. There is a small church on the island which was built in 1622 and a lighthouse. The island is also home to some rare indigenous species. Polyaigos holds important geological and ecological significance and is considered to be the best preserved island of the Mediterranean. Some of the recommended beaches to visit here are Pano-Kati Mersini, Panaghias t’Avlaki, Mandra and Faros. Back in the ‘70s and ‘80s, Corfu was one of the first places in the Mediterranean to attract mass tourism from the UK and northern Europe. Its party capital was the village of Benitses, on the east coast of the island. The party has long since moved on, and that’s the best thing that could have happened to Benitses. The legendary ‘Spiro’s at the Beach’ nightclub building remains, but very little else. Before all this, Benitses was popular as a retreat for the likes of Laurence Olivier, Paul McCartney and Audrey Hepburn. It’s now a quiet family resort with some lovely stretches of beach looking across the Ionian Sea to the mountains of Epirus and Albania. The small harbour is also lovely, and once you’re past the strip of restaurants, you can climb the cobbled backstreets up the hill to some fine old churches. We had some great food in Benitses. There are a few restaurants overlooking the sea, the best of which is the Avra on the Beach Tavern. We ordered the same starter a few times – feta baked in sesame and honey – which was one of the best things we’ve ever eaten in Greece. Palau on the island of Sardinia, in Italy, is in my opinion one of the best beach destinations in the Mediterranean and the world. From the town centre you can easily access on foot four different beaches and countless small coves, all locations where you can swim in the sea, tan on the beach, and on some of them even go windsurfing, sailing or stand up paddling. However the real highlight of Palau, which makes it a must-visit beach destination, are the nearby islands of the Archipelago of Maddalena. Palau is the main harbour from which you can rent a boat or go on a day boat trip to the islands of Spargi, Budelli, Santa Maria, Razzoli and Caprera. These islands have often been defined as the Maldives of Italy. With their crystal clear turquoise water and pristine white sand beaches, it’s easy to see why! One of the things that makes Sardinia beautiful is how wild it still is, despite the growing tourism masses that visit every summer. The beaches at the Archipelago of Maddalena have no services or facilities available, so if you want a sun bed or beach umbrella for the shade, you have to bring your own. That also means no toilets, so you either pick a boat tour with toilet onboard, or hold it till you return home at the end of the day! The swimming conditions are fairly easy everywhere, being an archipelago the sea never gets too rough since the beaches are always sheltered by a nearby island. If you’re looking for the best beach destinations in the Mediterranean, make sure to add Palau to your bucket list! 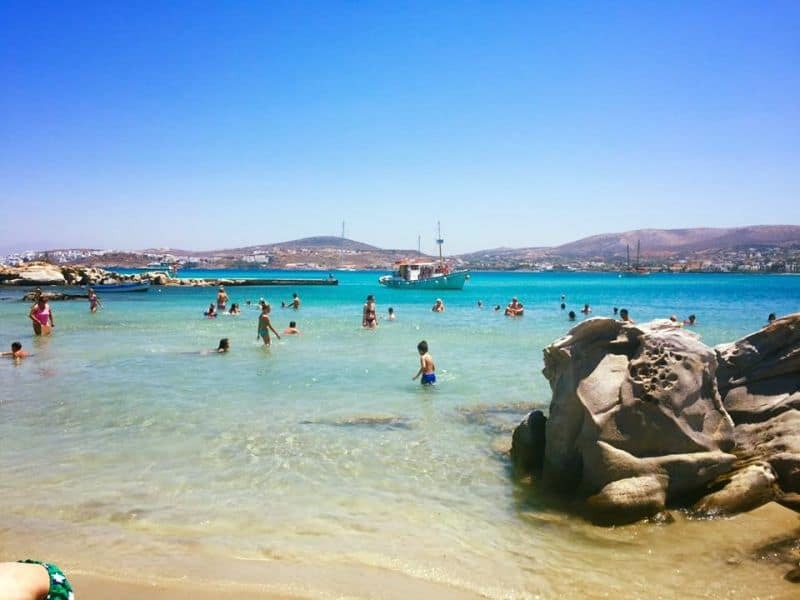 The beach at Kolymbithres is one of the most famous in Paros and is located west of Naoussa in Plastira Bay. It has huge boulders of granite positioned into the sea that have been worn away over the centuries into smooth sunbathing platforms. 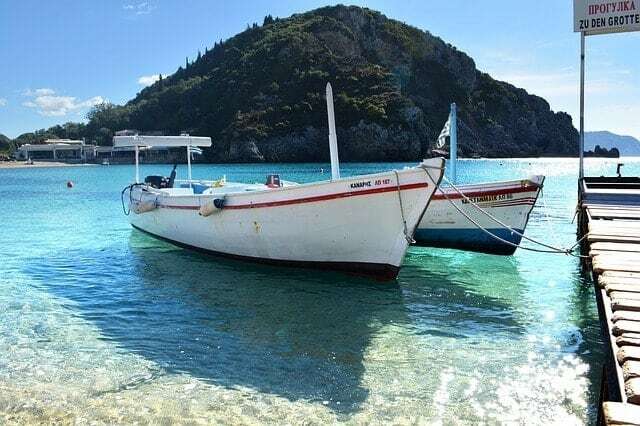 The water here is shallow and crystal clear and there is a great taverna right next to the beach which has some of the best home cooking on the island. You can drive around or catch the small public ferry over from Naoussa. It is a fairly casual type of beach – no sunbed rentals or drinks service, which is a big part of its appeal. The sea in Kolymbithres is calm and has crystal clear water. The wind is usually ideal for sailing and there are other activities available including sailing, SUPs and canoe rental. There’s also the Mycenaean Acropolis ruins from the last phase of the Bronze Age (600-1100 BC). A 20-minute walk will take you there, to the top of a rocky hill called Koukounaries. Refugees initially populated this Acropolis but it was destroyed by an earthquake sometime around 1200 BC. Alicante is one of the most popular tourist destinations in Spain, and it’s very easy to see why. With the advantages of having the facilities of a city and miles of beautiful beaches within the city itself and the surrounding areas, it just seems to have it all. 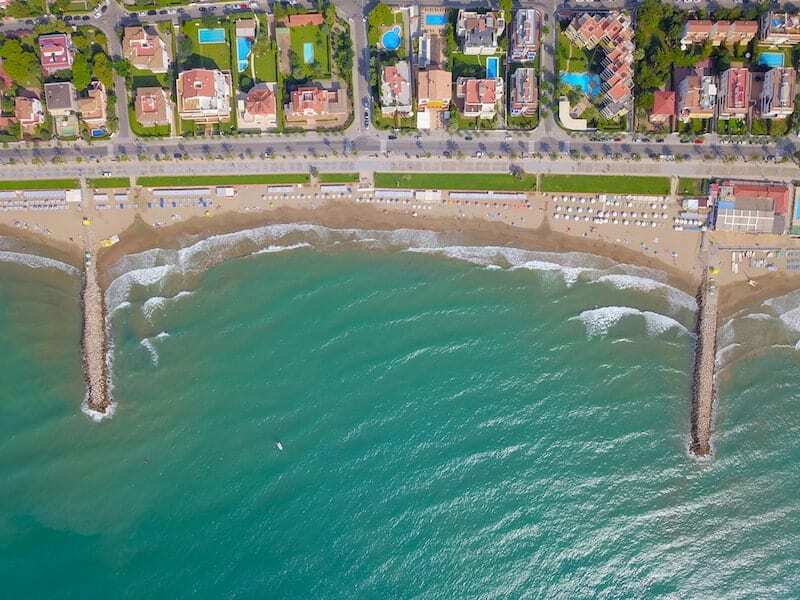 Right in the city centre, you have Postiguet Beach, located at the foot of the Castle and right next to the Marina and the Explanada promenade. Postiguet Beach is a blue flag beach that is well known for the quality of its golden sand, and it has a palm tree boardwalk and lots of cafes known as ‘chiringuitos’, where you can grab something to eat and drink. The beach is ideal for families, with designated playing areas, and the sea is really calm which is perfect if you like swimming. Its proximity to the Old Town makes it one of Alicante’s most popular attractions. The Old Town is incredibly photogenic, with full of beautiful narrow streets where you can feel the history all around you. It is crowned by the imposing Santa Barbara Castle, which is visible from pretty much everywhere in the town. Climbing to the top is a must do to get the best views of the city and the coast. If you are looking for an unforgettable beach holiday in the Mediterranean, your mind is likely going to the Greek Islands. While there are so many beautiful islands in Greece, I can’t think of a better spot than Chania, a lovely port city in Greece. Chania has a beautiful, historic Old Town with tons of cute harbourside restaurants, cafés, and shops. But Chania is also a great base for unforgettable beach day trips. My favourite beach near Chania is Seitan Limania, which is a gorgeous beach about 30 minutes driving distance from the city of Chania. It is a peaceful beach because in order to get there you have to hike down into a canyon down some pretty steep hills! It is well worth the journey, though; this is easily one of the prettiest beaches in the Mediterranean. The beach is rustic, with zero amenities – just whatever you bring with you for the day. There are no facilities of any kind, so be sure to pack in and pack out everything you bring for the day. The vibe is relaxed and chill, as you are sharing the beach with only a few other intrepid people (and the occasional goat who likes to come visit the beach and disturb the peace a bit). The sand is a lovely, soft pale yellow and the sea is turquoise and calm as can be. The water is a bit cold as it is sheltered from the sun much of the day by the canyon, but it is especially refreshing on a hot day! Besides Seitan Limania, there are several other beautiful beaches near Chania, including Elafonisi and Balos, both of which are stunning as well. 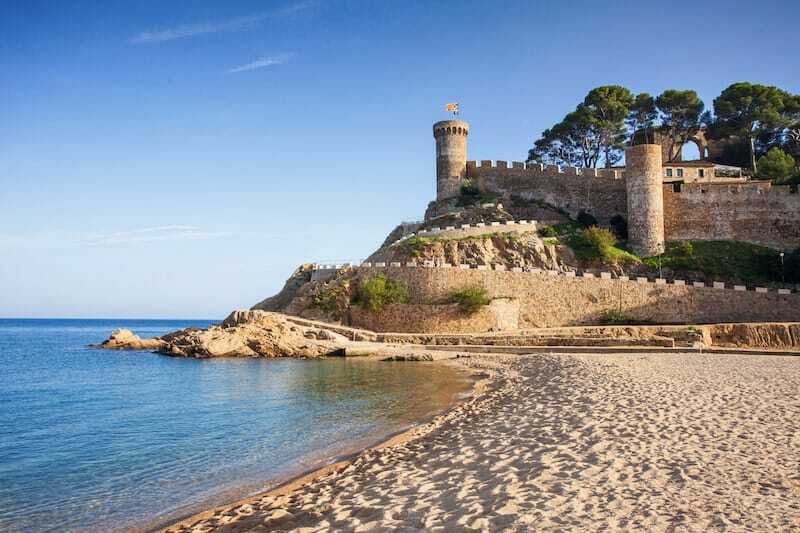 Just 1.5 hours north of Barcelona, Spain, is an alluring Costa Brava town, called Tossa de Mar. It’s most notably known for its postcard-worthy medieval walls of the Vila Vella (‘Old Town’) next to the main beach. The 14th-century walled town is the only fortified medieval town along the Catalan coast. Its narrow and crooked streets are fun to explore sweeping views of the coast, the town below, and boats dotting the Mediterranean Sea. Make sure you get a selfie with the statue of actress Ava Gardner, who starred in the movie ‘Pandora and the Flying Dutchman’, filmed in Tossa de Mar in 1950. 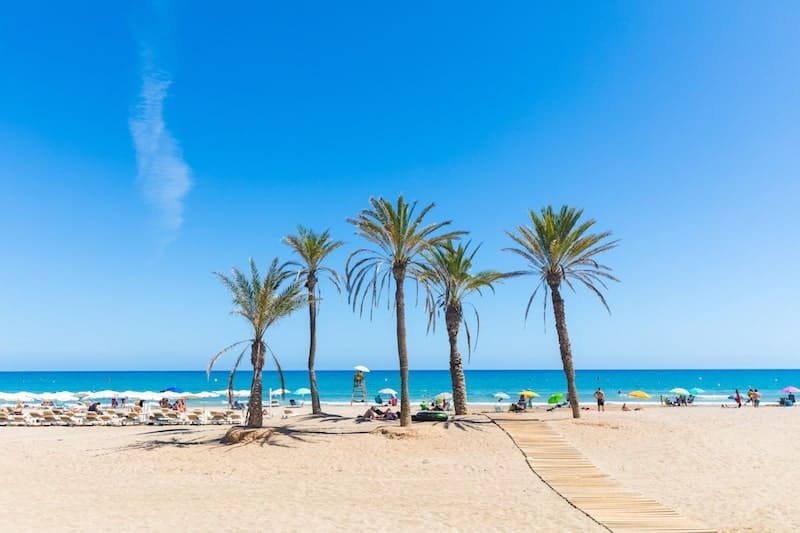 The main beach is called Platja Gran and has been awarded a Blue Flag, which means that its cleanliness and quality are top-notch. Waves are usually low, which make it a great spot for kids to splash about. Behind the Platja Gran are a row of not overly touristy seafood restaurants, ideal for terrace seating. For activities, try the glass-bottom boat or take the touristic train up to the Villa Vella. The Platja Gran is probably the most crowded beach, but around you can find smaller, more intimate coves around Tossa de Mar like the Es Codolar or Cala Pola. Tossa de Mar is a relaxing but culture-rich town ideal for both soaking in the sun and Catalan culture. Croatia’s popularity rose – particularly Dubrovnik’s – thanks to it being a shooting location for the Game of Thrones series. 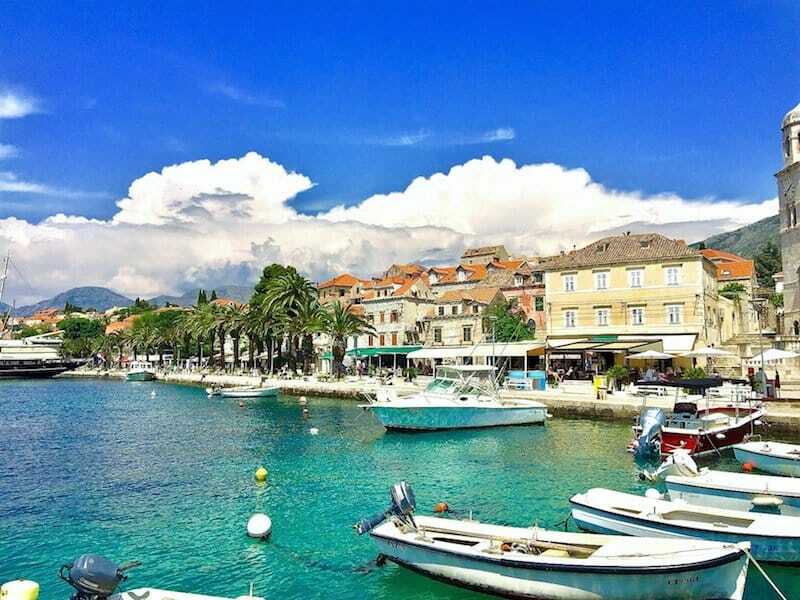 But Croatia has a lot more beautiful cities, regions, and islands worth visiting. Take the island of Vir for one; surrounded by the clearest and bluest waters of the Adriatic sea, it’s a perfect summer go-to for families with children. Vir has a 32 kilometer long coastline, there are a lot of awesome beaches (pebbled, sandy) with water that isn’t so deep. Jadro beach, for example, is a safe area for kids to do light snorkelling. What with its crystal clear waters, they’d be delighted to see fish and crabs going about. There are also a lot of summer sports that can be played; beach volleyball, kayaking, water dodge ball to name a few. If you’re up for a fancy adventure, you can go canoeing, kitesurfing or simply rent a boat to visit a nearby island. The main village on the island is the eponymous village of Vir and has a lot of beach bars, restaurants, accommodations, and relaxing areas for when you want to be lazy (read: watch people, count birds, see if the waves got bigger). As for food, seafood is a must! You can’t get fish, shrimp, clams, crabs, oysters, and all the fruits of the sea any fresher! I would recommend the brudet/brodet; similar to the French bouillabaisse, but definitely different in many ways. There’s of course a diverse selection of Mediterranean cuisine, Italian offerings, finger foods, and fusions of African, European dishes in different food establishments. But take note of food specially Croatian: a mix of Greek and Roman culinary arts, try the crni rižot – black risotto brought about by the cuttlefish or squid, and squid ink . . . your tongue and teeth will definitely turn black but just wash it down with some good wine, and you’re ready to smile again. Cacela Velha is a small village hidden in the stunning south coast of Portugal. The beaches in the area are hard to get to, but most certainly worth the effort. From the top of the village you can view where the beautiful Ria Formosa lagoon meets the Mediterranean Sea and the unique beaches of white sand in between. To get them you can either catch a typical fishermen boat to cross the lagoon or, if the levels of the water permit, you can also walk to the beach. This little adventure is actually one of our favourite memories from Cacela Velha! This means that you don’t get the crowded beaches you find on some of Algarve’s hotspots. The vibe is very peaceful and the water is warm and calm. In Cacela Velha itself you can find a few restaurants, and most serve delicious seafood. Even though hotels are not found in this small village itself, accommodation nearby is plentiful and affordable. 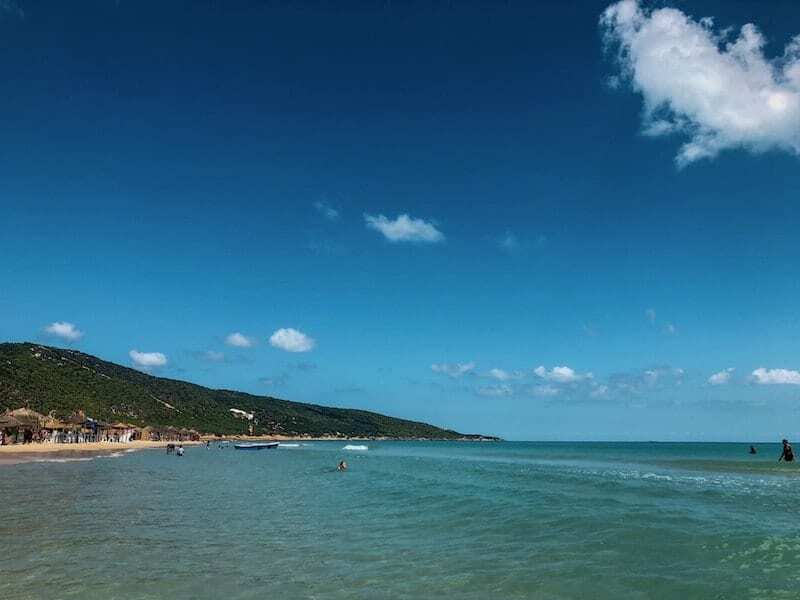 Cacela Velha is a hidden pearl covered in beautiful white houses and surrounded by sparkling blue water and certainly one of the best beach destinations in the Mediterranean. It’s impossible to talk about the Mediterranean beaches and not think of Nice, in France, as one of them. Located at the French Riviera, it’s one of the largest cities in France, with a population of over 1 million people, and the gateway to charming Monaco and Cannes. The city has attracted the European aristocracy and artists over centuries, like Marc Chagall and Henri Matisse, which makes it not only a sophisticated beach destination but a rich cultural centre as well, with several museums. 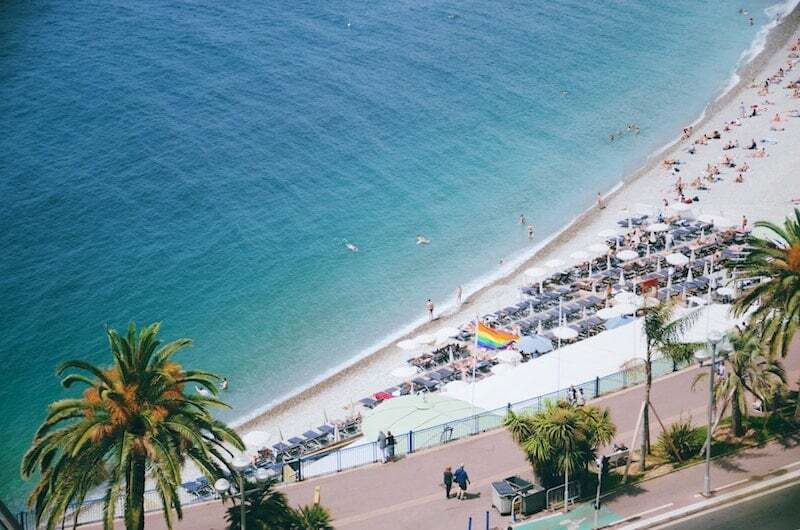 Being one of the most visited cities in France, Nice has a huge hotel capacity, with accommodation for all types of people and budgets. The sea has that marvellous shade of blue that only the Mediterranean can offer, and the sand is actually made of grey pebbles, which may sound a bit unusual for those used to soft white sand. It’s common to see plenty of floaters around – not to be used in swimming, but to soften the impact of lying on the pebbles to get sunbathed. Nice is a very pleasant city all year round, and apart from the beach you can also take long walks at the Promenade des Anglais or the several local squares, visit the local Opera and beautiful markets, enjoy fancy boat rides or take day trips to Cannes, Grasse, and Monaco. It’s a must visit at the Mediterranean! The Costa Brava has some of the most beautiful beaches in Spain. 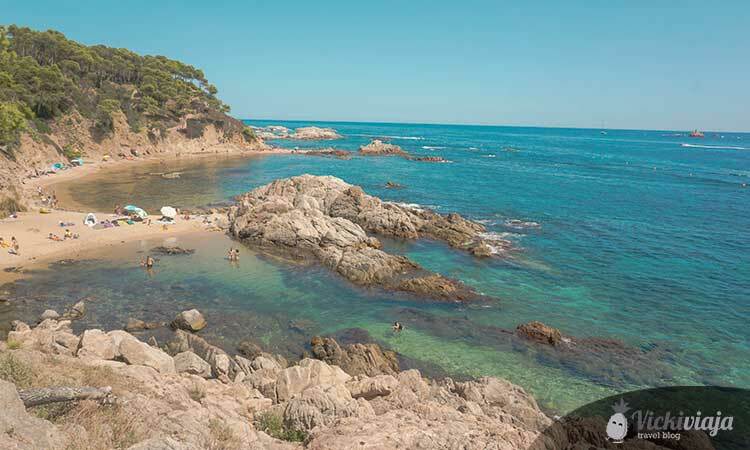 Arguably, the beaches of Palamós are part of those. Even though Palamós has several beaches, the beaches Platja de Castell and Cala Estreta are the most beautiful ones. With their turquoise water, both beaches provide the absolute paradise beach vibe. The Platja de Castell is near a parking spot and easily accessible. Therefore, you can find many people here in the summer. On the other hand, this beach offers great opportunities for watersports or renting sun banks and umbrellas. At this beach, you can also have some ice cream or drink at the beach bar. The beach Cala Estreta is a little bit more remote. To reach it, you need to walk along the cliffs of the Costa Brava for about 25 minutes. Therefore, you will find much fewer visitors here. On this beach, there are no services offered like water sports and you don’t have the option to buy snacks or drinks. On the other hand, this beach is much more peaceful and quiet than Platja de Castell. Anyway, both beaches are amazing for snorkelling as there usually is crystal clear water. You can find different types of fish swimming around the area and it is interesting to watch them while snorkeling in the refreshing water of the Costa Brava. Sitges is a small town about half an hour’s drive from Barcelona and a very popular day trip. While the town is mostly known for its LGBT friendliness and its beaches, Sitges also has a very long and rich history dating back 53,000 years to a Neanderthal jaw found in a cave nearby. The word Sitges means ‘silo’ in English and it refers to the underground holes used to store wine. Before the tourism boom of the 60s and 70s, Sitges was a wine-producing fishing village big in shoemaking and with a thriving artistic and cultural scene. Many of the locals emigrated to Cuba at the end of the 19th century and returned after making fortunes, bringing with them money that revitalised and developed the town. One of them was Bacardi, the founder of the famous rum company whose museum can be found in town. If you are visiting for the beaches, you will find 3km of it split among several smaller beaches separated by rocky piers. The farther you walk on the promenade away from the town the less people you will find. If you are interested in a nudist beach, there is a mixed one under the cemetery. All the beaches have lifeguard stands in the summer months, showers and some have bathrooms too. For food, Sitges seafront is lined with lots of restaurants. For a more premium option, check out La Fragata under the church. A casual restaurant would be the first pizzeria in Spain right in the middle of town, in El Cap de la Vila. For tapas try one of the Basque places. Enjoyed this post? Follow us on Facebook or Twitter.